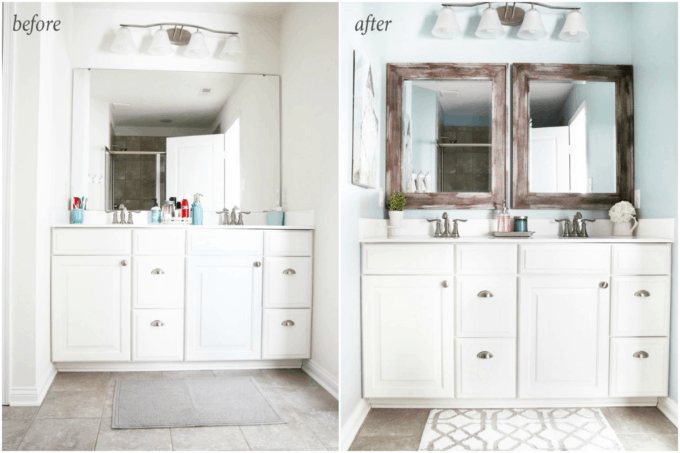 I’m sharing all of my favorite master bathroom organization ideas and some easy updates that we’ve done to take our master bathroom from cluttered and boring to organized and beautiful! 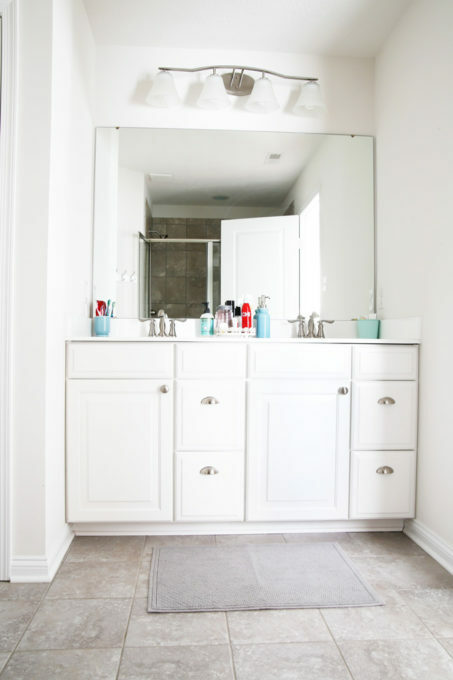 When we first moved into our current house, I thought that our master bathroom was going to be one of the easiest areas to organize. I had the master bathroom in the townhouse organized exactly the way I wanted it, so I just thought that I would take that exact system, replicate it in our new master, and be done. 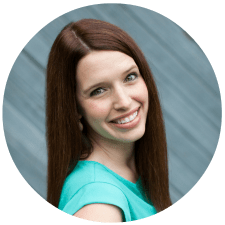 You see, like I’ve realized with many areas of our home, our master bathroom was one of those spaces where, just because a system was perfect in our last house, didn’t mean that it would work in our new house… at all. …Well here we are 18 months later, and I’m just getting around to it! Oops! 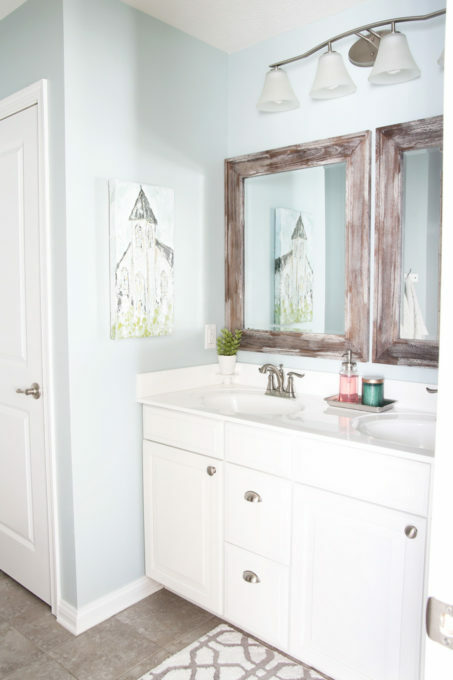 I am so thrilled with how everything turned out, though, and I’m so excited to share our new and improved master bathroom with you today! 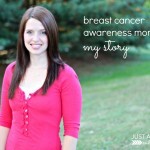 A huge thanks to InterDesign for sponsoring this post! 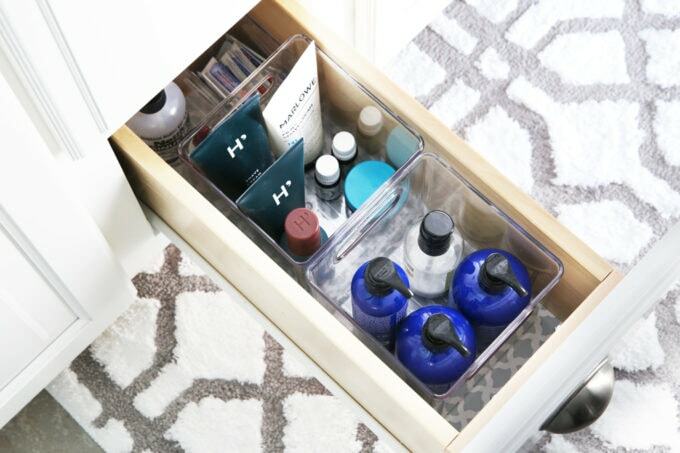 My favorable opinion of beautiful and functional bathroom organization products is 100% my own. 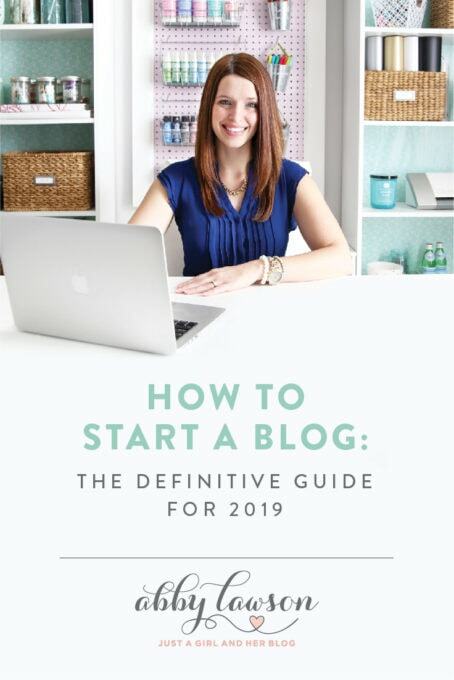 🙂 This post contains affiliate links. For more information, see my disclosures here. Our bathroom was the definition of builder grade. It was very bare, with just stone gray tile and stark white everything else. Since I rarely do anything halfway, while I was getting organized, I decided to do a few updates to this space as well. I happened to have some leftover paint from my office makeover, so I painted the walls to make the space a little more cheerful. (The color is Rainwashed by Sherwin Williams.) We also switched out the single builder grade mirror for two wooden framed mirrors, which I like so much better. 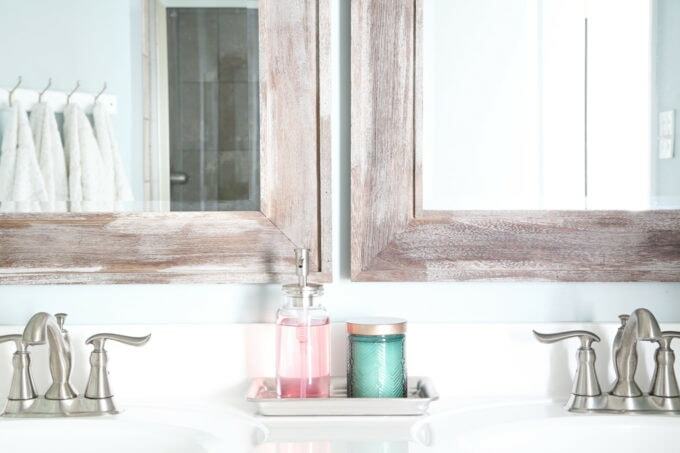 I had a bunch of items cluttering up the vanity top before, so I cleared most of that away and just kept it simple with a pretty candle and a cute tray and soap dispenser, both from InterDesign. On to the cabinets and drawers! Since my previous system (or lack thereof) wasn’t working in here at all, I cleared everything out and started from scratch. I sorted through all of our items, and was able to get rid of a ton of stuff we didn’t need anymore. Then I took a look at what I had left and created simple systems to keep it all organized. First I lined all of the cabinets and drawers with a pretty liner just to protect them a bit. 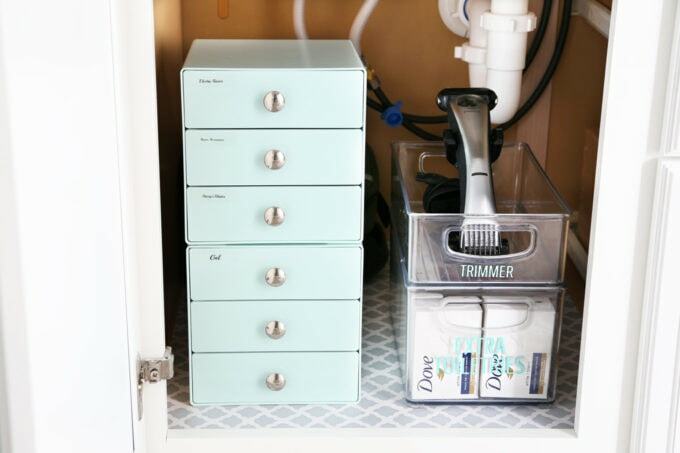 This is Donnie’s side of the vanity, and he had a bunch of trimmers and razors and accessories to go with them, so I got two of these cute mint colored drawer units and gave each type of trimmer its own little spot in the top one. 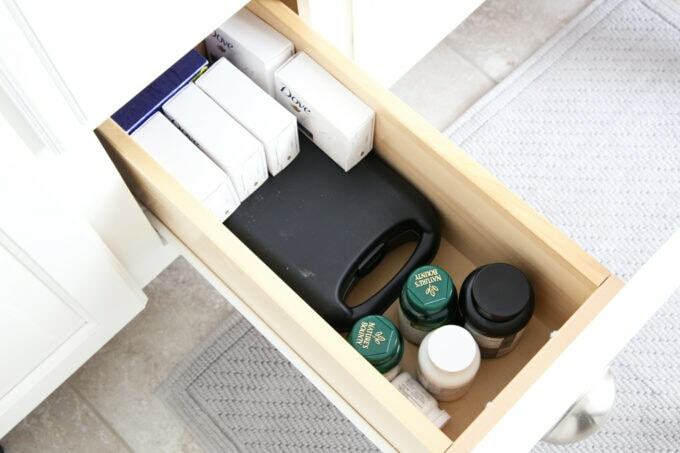 The bottom drawer unit has some different gels in the top drawer, but the two bottom drawers are actually empty, which gives him room to grow if there are more items he needs in the future. I used my label maker and clear labeling tape to put a discreet label on each drawer so he could easily see what’s in each one. 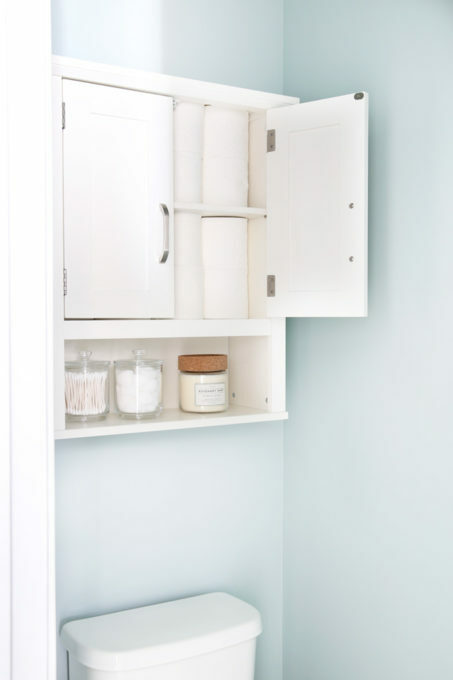 I like to add height in the bathroom cabinets to make items easier to grab, so I stacked two clear InterDesign bins, this taller one and this shorter one. 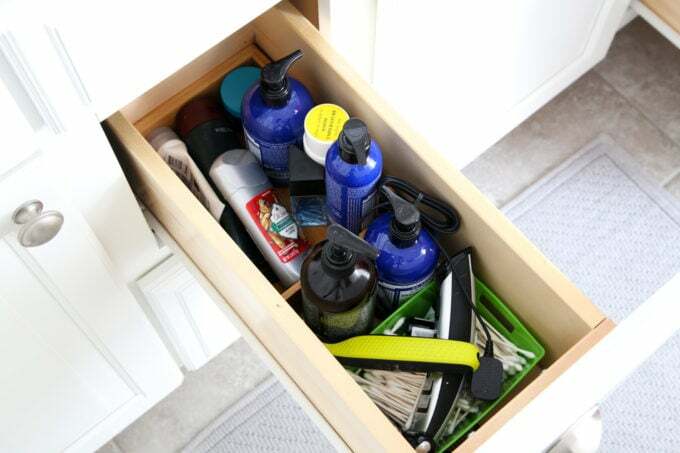 When I use stacking bins, I always put the items I access more often in the top bin, and the items that I use more infrequently on the bottom, so here I put our extra toiletries that we only need to grab every once in a while on the bottom and Donnie’s trimmer that he uses every day on the top. I always like to put a pop of color on clear bins, so I made some labels with my Silhouette cutting machine and adhesive vinyl. 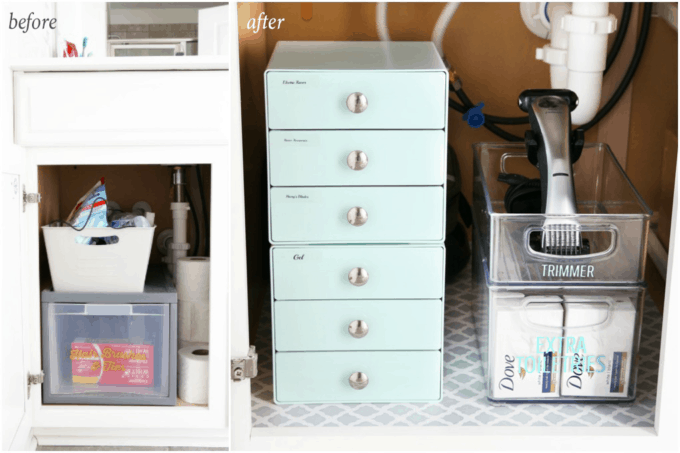 This cabinet previously held our toilet paper as well, but I ended up moving the it out of our vanity and into a little cabinet in the water closet area to make it more accessible and to make the vanity less cluttered. Donnie’s top drawer has some vitamins that he takes at night, which I put in a clear 6” x 6” InterDesign bin. 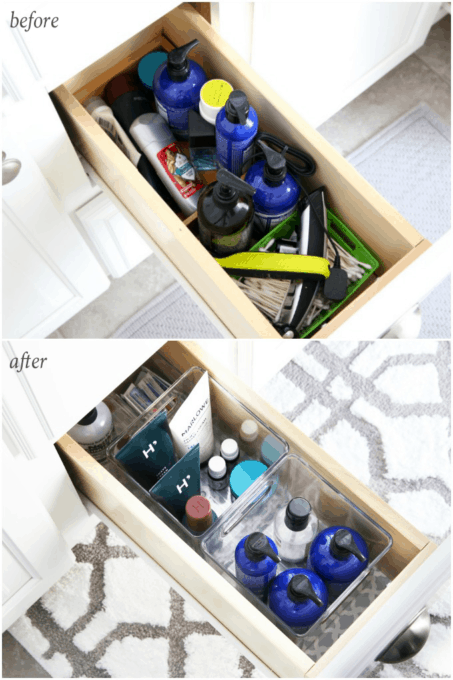 If you have deep vanity drawers like these, these square bins are my go-to! They are the perfect size to corral items and keep them from falling over. 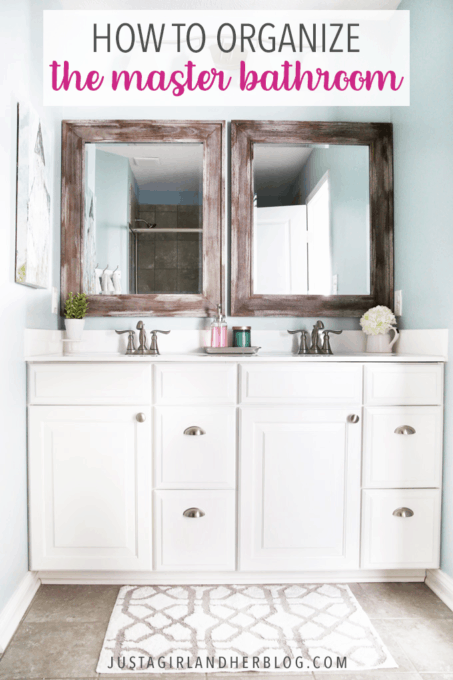 I’ve used a ton of them, both in this vanity and in our boys’ vanity as well. 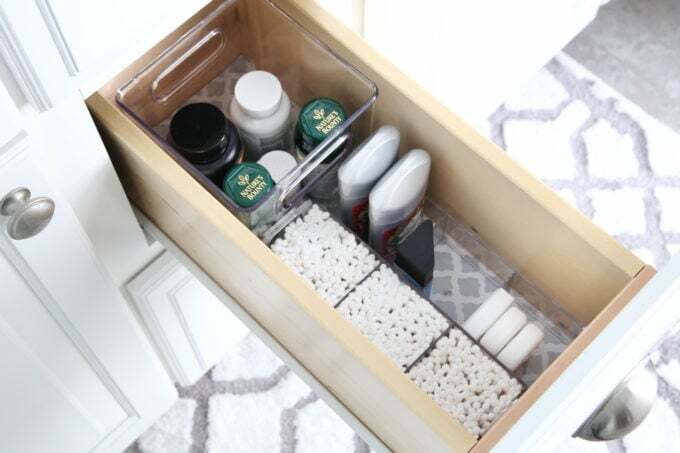 Two little divided InterDesign containers (a taller one and a shorter one) also fit perfectly side by side in this drawer and hold some of Donnie’s getting ready essentials like q-tips and deodorant. 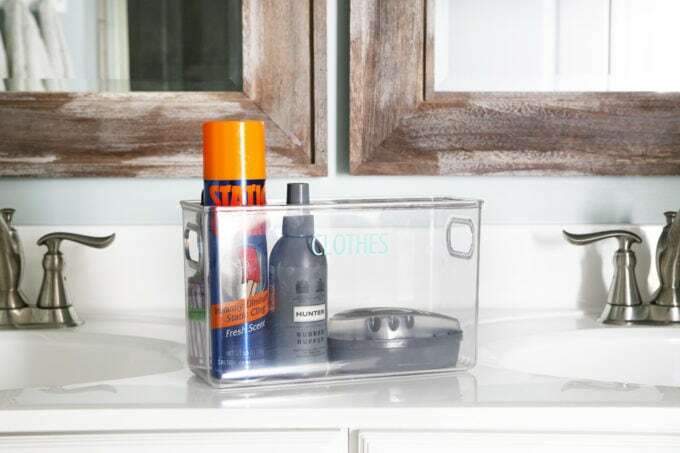 I told you I love these 6” x 6” bins, and Donnie’s bottom drawer holds two of them to corral his aftershave and other bottles. 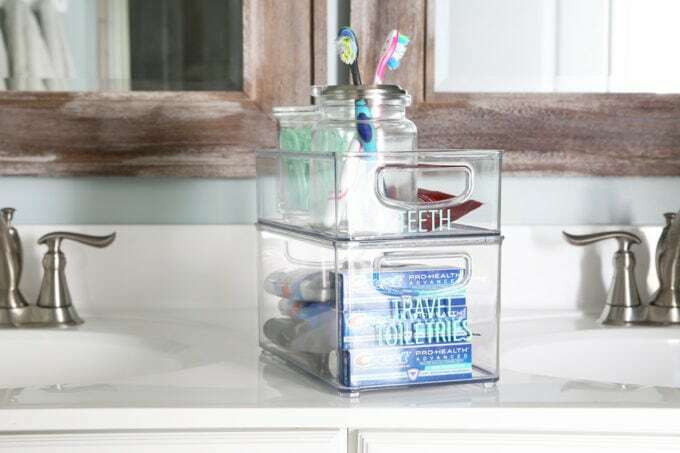 Our travel toiletries that we only need every once in a while are in the bottom bin, and everything having to do with our teeth– toothbrushes, flossers, and toothpaste– are easily accessible in the top bin. 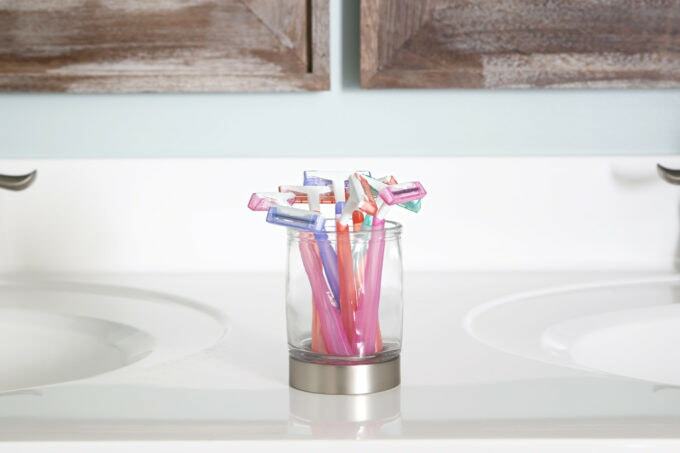 I like to keep the toothbrushes tucked away so they’re not exposed to all of the airborne stuff in bathrooms! 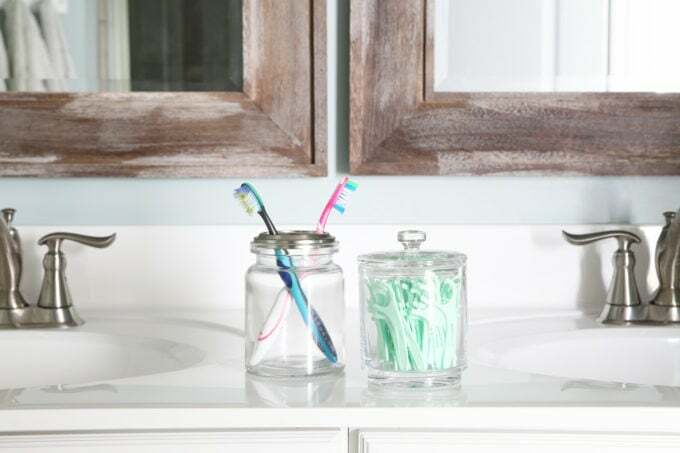 The cute toothbrush holder is from InterDesign as well, as is this little glass apothecary jar. I grabbed a few of these because I think they’re so pretty and also really practical for holding small items. Back in the back I tucked another small bin to hold items I use sometimes when I’m getting dressed in the morning– lint rollers, static guard spray, and a little kit to shine my rain boots. 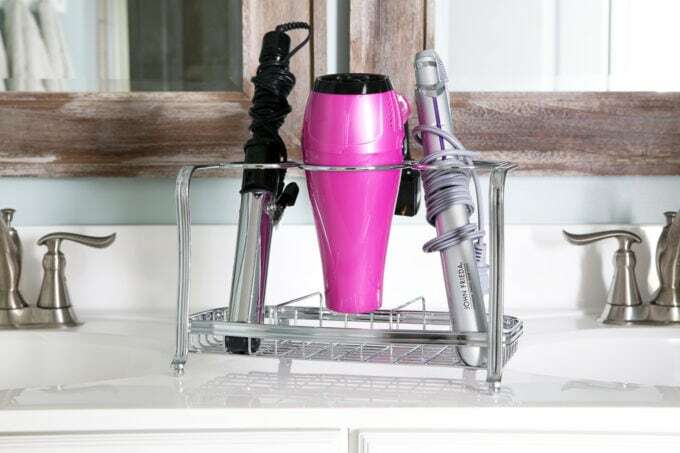 This little three slot organizer was perfect for holding my hair items– my brush and a few combs, and I have my backup shampoo and conditioner right behind it. 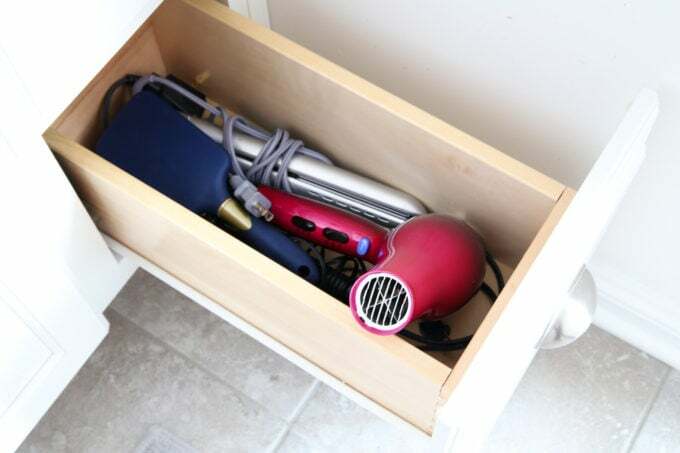 I searched far and wide for the perfect way to store my hair dryer, straightener, and curling iron, and this simple holder from InterDesign was exactly what I was looking for. Each item has its own little slot, and they’re easy to grab when I want to use them. Finally, my drawers have a similar setup to Donnie’s, though they’re holding different things. 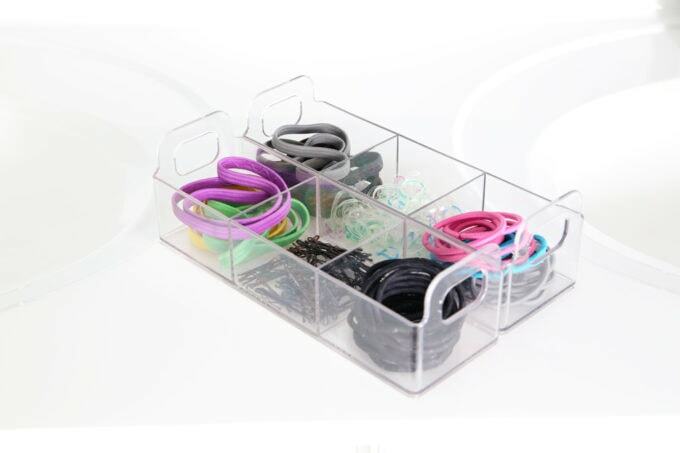 My deodorant and hair supplies are in the square InterDesign bin, and then these separated containers hold all of my hair ties, bobby pins, and headbands. 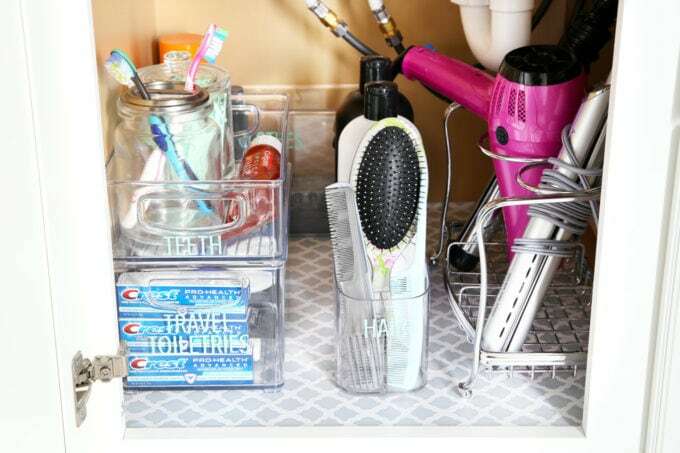 I love how everything is separated out so they are easy to see, and I can quickly find what I need when I am getting ready in the morning. 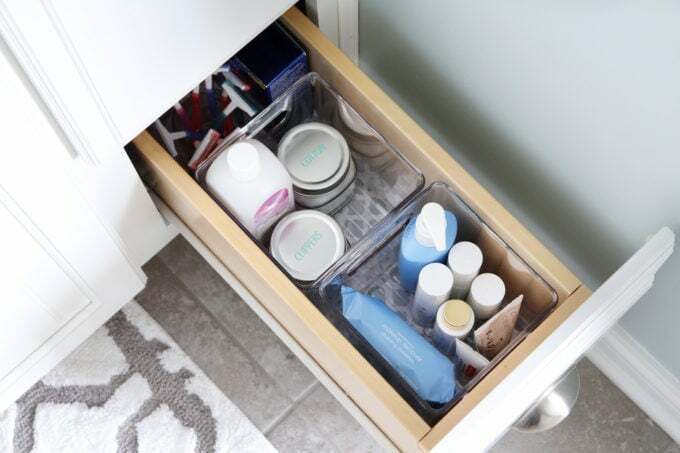 The bottom drawer has more of my favorite square bins, with skin care items in the front, and nail care in the back bin. I used two mini mason jars that I already had to hold my clippers and cotton balls and used vinyl labels on the top so we could easily see what was in each one. The very last thing tucked back in there is actually an InterDesign tumbler, but it was the perfect size to hold my extra razors, so I can grab one when I need to switch them out. So that is the grand tour! 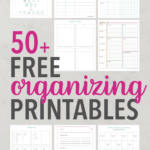 If you’ve been following my blog for long, you know that I am a huge fan of InterDesign because they have just about every organizing product that you can imagine in every shape or size possible. 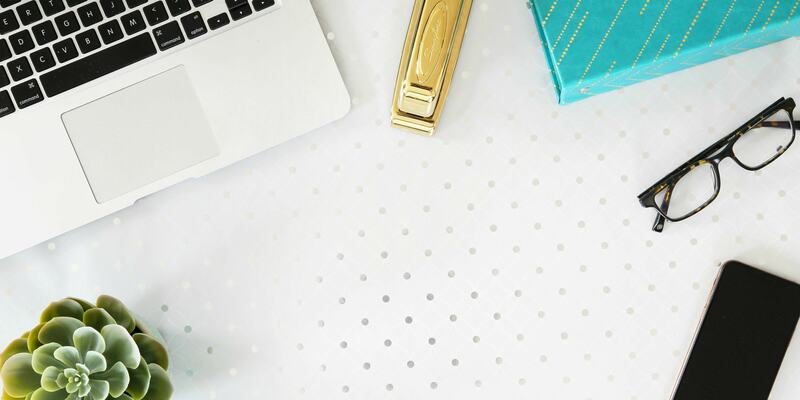 They have definitely become my go-to– I just search for them on Amazon or at places like Target, Walmart, Bed, Bath & Beyond and The Container Store, and I know I’ll be able to find exactly what I need! 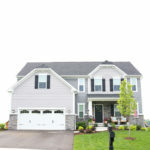 Should we take one last look at some before and afters?! So much better! 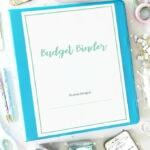 If you’re looking for exact links to anything I mentioned in this post, I tried to list as much as I could below! 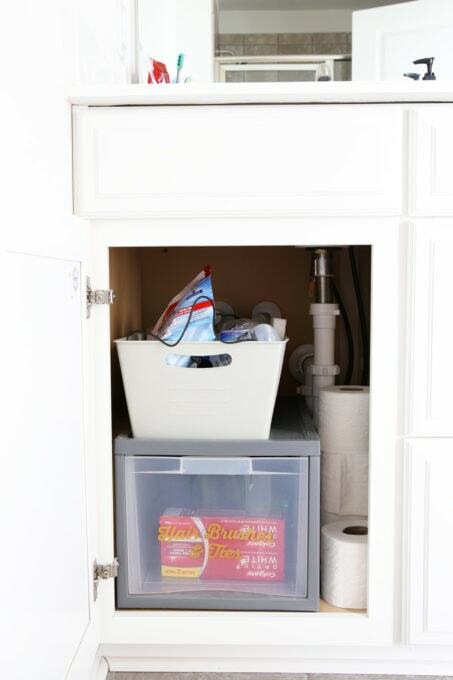 I would love to hear your favorite tips and tricks for keeping your bathroom organized, so be sure to tell me about your systems in the comments below! Hi, Katy! I talked about my makeup organization in this post: https://justagirlandherblog.com/minimalist-makeup-organization/. 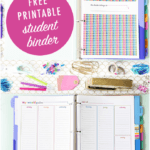 Thanks so much for the printables , Abby. What a clean look! Great ideas, thank you! 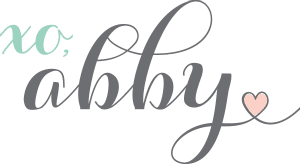 -Nice post, Abby! 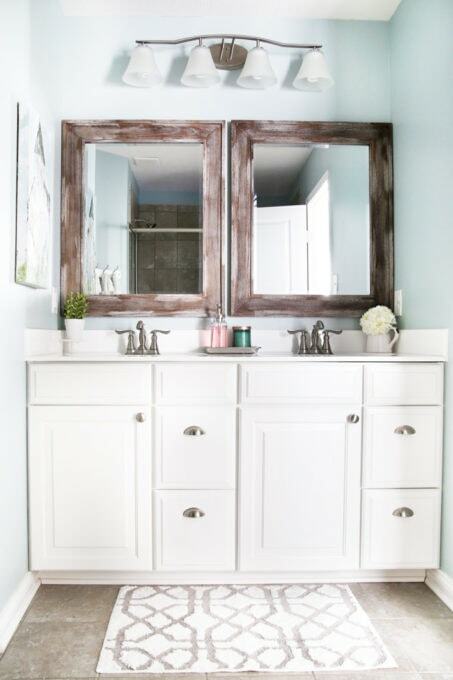 Gives me some ideas to implement in my wee bathroom! Thanks, friend! Fabulous! 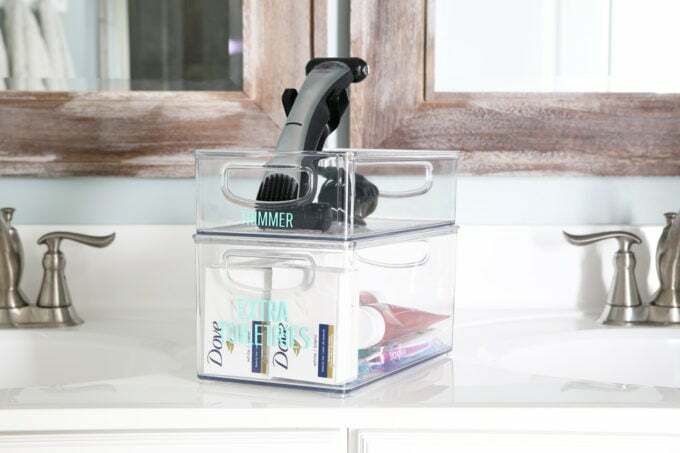 I definitely need some of those clear bins. My master bath is way worse than your “befores.” Lol. I love all of those bins! 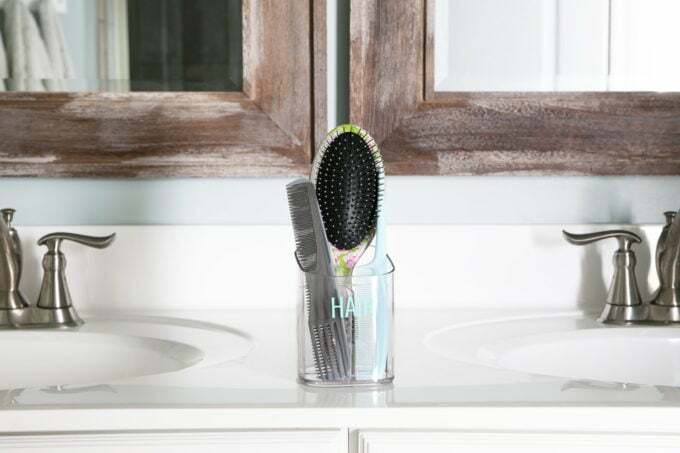 Such a great way to keep all the things corraled and off the countertops! Thanks for the tips Abby! The bathroom looks great! Abby, this is wanting me to re-organize everything in my house! I love all these organizers and you always do the best job. Can you come over to my house? 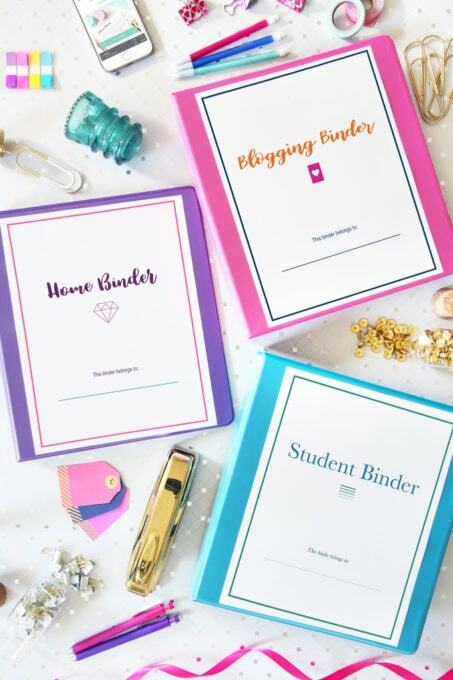 These organizers are fantastic. I’ll be right over! 😉 Thanks so much, sweet girl! 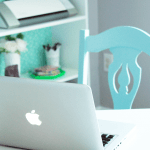 Thanks for sharing where you got your little bins at too – love those! The bathroom looks fantastic, Abby! 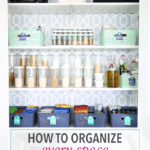 I love all the organization tips and tricks – definitely putting some into action! I love this transformation Abby! And I envy your organizational skills. I definitely need to try some of these products! Wow! Awesome transformation! 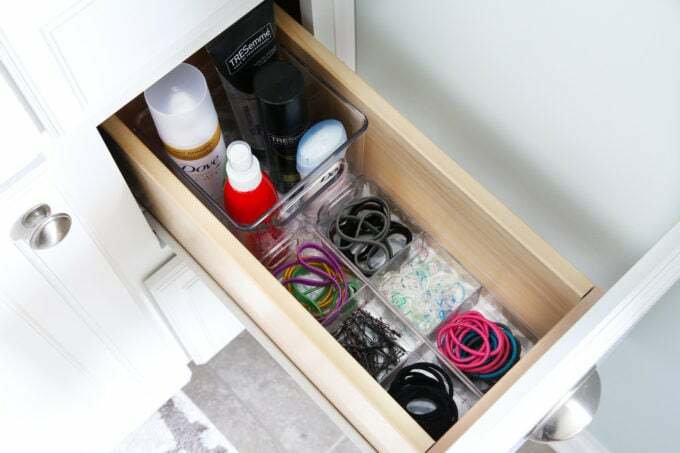 I LOVE my InterDesign fridge organizers so I’ll definitely have to look into their bathroom line to whip our vanities into shape. Hope you love it as much as I do! 🙂 Have a great evening, Chelsea! I love what you did with the under the sink space. And, btw, LOVED your mirror frames. 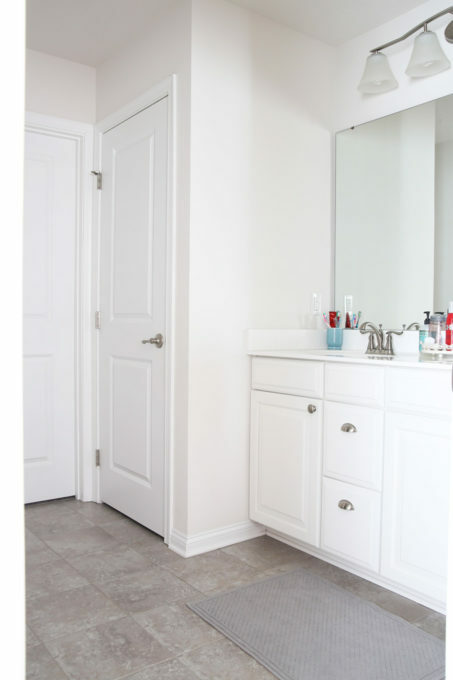 Whole bathroom is very clean, bright, and organized. Very beautiful and motivating, thank you! Haha! Aqua lovers unite! 🙂 It really is such a calming and relaxing color… love it! Thanks so much for recommending me… hope it’s helpful for her. Hope you have a great week!